Our Let It Ride tables are beautiful and will add an unbelievable look and feel to your casino party or event! Our Let It Ride tables are of the highest quality materials and will give your event a great look and feel! Let It Ride is a casino variation of poker, played on a table similar to a blackjack table. The game is popular because it offers a potential for high pay outs. The twist is that as the cards are revealed the player has the opportunity to decrease their bet if they don’t like their cards. 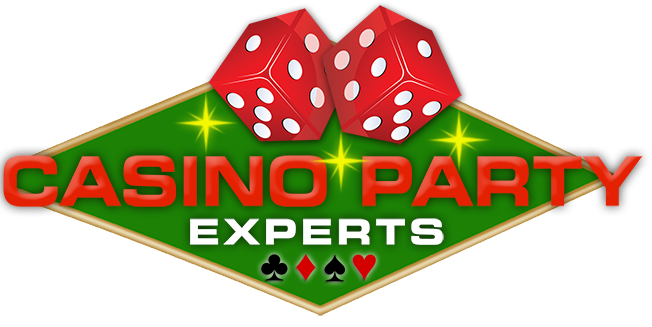 Because the players are not playing against each other or trying to beat the dealer, players develop camaraderie among themselves creating a fun and exciting atmosphere for everyone. This game is played on a Full Size Blackjack style Table and comes with 7 Player Positions plus a Dealer Position- also includes are 7 jumbo size Cup Holders – Dealer Chip Tray full of chips – Padded Armrest – ¼ moon wooden legs – Wood Reinforced Exterior Frame – Size 76”W x 36’H x 48″D. Table is covered with a digitally printed synthetic felt that doesn’t absorb liquids. Underneath the felt is open-core foam which also doesn’t absorb liquid. If a guest spills a drink on the table, a bar towel can be used to clean up the spilled liquid in a matter of moments and the entire table is ready for play again. Let It Ride was first introduced to the casinos in 1993. Shuffle Master Incs, the company that makes those automatic-shuffling machines, created it. The game is popular because it offers a potential for high pay outs. Because the players are not playing against each other or trying to beat the dealer, camaraderie develops among the players creating a fun atmosphere. The game and the correct playing strategy can be learned quickly. 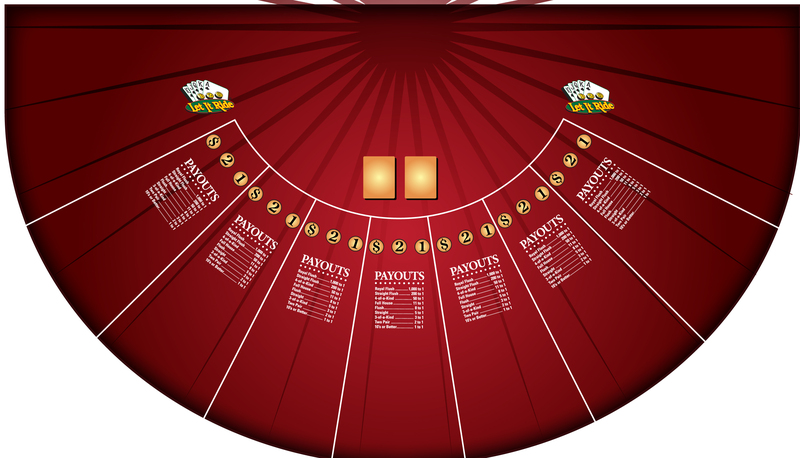 The game is played on a table similar to the blackjack tables. There are three circles in front of each player on the table. The circles are marked with the numbers 1. 2 and $. To start the game a player places three equal bets in each circle. The dealer deals out cards three at a time. The dealer places the three-card hand in front of each player. After each player receives his cards the dealer discards one card leaving two cards face down in front of the dealer. The machine counts out the remaining cards into the discard tray. When this is finished the players are allowed to look at their three-card hand. At this point you have the option to take back your bet in circle number one or Let It Ride. To take back you bet you scrape your cards on the table toward you or make a brushing motion with your hand. After all the players have made their decisions the dealer will turn up first of the two community cards which is in front of the dealer. This card is used as the forth card for all the players hands. You now have the option of taking down your second bet or letting it ride. You may take down the second bet even if you let the first bet ride but you cannot take down or put the first bet back up. After all the players make their decision for the second bet, the dealer will turn up the second community card. This card completes the five-card hand for every player.